During our early research, we devised two novel cellular models of skeletal muscle ageing (Sharples et al., 2010 J Cell Physiol; Sharples et al., 2011 J Cell Biochem), which resulted in an ECR award (Sharples) for best oral stem cell communication at the prestigious Max Planck Institute, Berlin (2010). A novel aspect stemming from these works suggested aged muscle cells could ‘remember’ inflammatory environmental stimuli to which they were exposed in early proliferative life, a concept that we have recently defined as muscle ‘memory’ in the leading international journal Aging Cell, click for PDF). Importantly, we confirmed this phenomenon, where we were the first to report a molecular mechanism for muscle ‘memory’ at the DNA level in a muscle cell model, showing aged muscle cells retained molecular ‘tags’ to their DNA (via DNA methylation) in later-life following early-life inflammatory stress. This publication (Sharples et al., 2015, Link) in Biogerontology has had over almost 4000 downloads on researchgate/ the publisher’s website, where at the time it was the highest-scoring output from this source. Importantly, in 2016 this work resulted in a prestigious Doctoral Training Alliance UK, PhD scholarship (R. Seaborne) and culminated in further grant success with pharma industry giant GlaxoSmithKline (GSK) to investigate the genome-wide epigenetics (Illumina EPIC BeadChip arrays) of muscle growth and memory in animals and humans. From these studies, in collaboration with Prof. Jarivs (LJMU) we have published a paper in international journal FASEB J (link) establishing novel epigenetic mechanisms in muscle wasting and recovery in rodents using both transcriptomic and epigenetic analysis (microarrays and pyrosequencing respectively). Importantly, The Muscle Lab has published a paper in Scientific Reports (Nature) (Click for PDF), identifying for the first time that human skeletal muscle possesses an epigenetic memory of previous exercise, and the discovery of novel epigenetically regulated genes across the methylome in skeletal muscle growth. This article received international attention where the paper released by our universities press office received 39,000 reads on the university webpage, was picked up by over 27 media/news outlets including; Science Daily, Yahoo News and Newsweek. The story was also published by IFLScience with 25 million followers on Facebook and was the top story in Reddit on the day of the article with over 24,000 upvotes. The paper has now received over 1200 tweets on social media from 1000 different users, with an upper bound of 1.7M followers, and was featured on ABC radio in Australia. The article itself has been read on the nature web page over 32,ooo times (Click for PDF). We have published a sister paper in Scientific Data (Nature- PDF) describing the detailed methods for the genome-wide DNA methylation analyses from human skeletal muscle after acute resistance exercise, training, detraining and retraining. Importantly, for the first time most recently across the entire transcriptome and epigenome combined, we identified novel differentially methylated genes associated with human skeletal muscle anabolism, hypertrophy and epigenetic memory (Turner et al., Scientific Reports, 2019, PDF). In this area, also checkout our recent published a book chapter for international publisher Elsevier, entitled: Epigenetics of skeletal muscle aging (link). It is worth noting that have just received another grant from North Staffordshire Medical Institute (NSMI), UK to investigate the epigenetics of sarcopenia and muscle disuse after falling injury and surgery in elderly patients. Finally, we are currently writing an invited book chapter for Elsevier that will be included in a series called ‘Epigenetics in Exercise Science’ in the book Sports, Exercise, and Nutritional Genomics. This should be published late 2019, so stay tuned here for the link! 1. 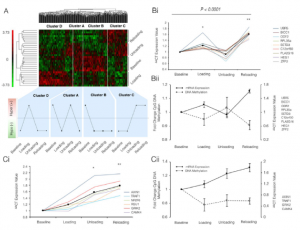 A Novel Epigenetically Regulated E3 Ubiquitin Ligase in Skeletal Muscle Remodelling and Ageing. We have recently identified that an E3 Ubiquitin Ligase, called UBR5, previously unstudied in skeletal muscle, is epigenetically regulated (via DNA methylation) with altered gene expression after human skeletal muscle loading, unloading and reloading (Seaborne et al., 2018 Sci. Reps, PDF). We have now released a paper on characterising the role of UBR5 in skeletal muscle hypertrophy, atrophy and recovery from atrophy as a Pre-Print in BioRxiv (click for PDF). We show that UBR5 is a novel E3 Ubiquitin Ligase important for skeletal muscle hypertrophy & recovery from atrophy after disuse and injury. Also, that it has opposite roles to other well known E3 Ubiquitin Ligases, MuRF1 and MAFbx! We use several in-vivo and in-vitro approaches in human, animals, bioengineered models and cells at the genetic, DNA methylation, gene expression and protein level to characterise this newly identified ligase in the regulation of skeletal muscle mass. Check it out! PDF. It is important to say that to enable this paper to be produced we collaborated across international centres with Prof. Sue Bodine, Dr. David Hughes and Dr. Leslie Baehr (Iowa, USA), Prof. Jonathan Jarvis, Dr. Owens, Dr. Illdus Ahmetov (LJMU, UK) and Dr. Robert Seaborne (QMUL, UK), without whom the paper would not have come to fruition! Figure above. A: UBR5 is hypomethylated and gene turned ‘on’ after resistance training and detraining in humans. 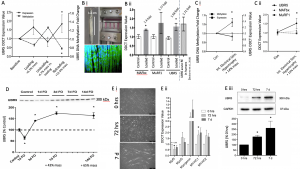 B: Acutely loaded bioengineered muscle loaded in a bioreactor (Bi) demonstrates increased UBR5 gene expression similar to after acute resistance exercise in humans (Bii). C: UBR5 gene expression increased after hypertrophy in rats after 4 weeks of intermittent high frequency electrical stimulation with reductions in DNA methylation (Ci), without increases in MuRF1 and MAFbx (Cii). D: UBR5 protein abundance rapidly increased at 3, 7, and 14 days post synergistic ablation/functional overload (FO) induced hypertrophy in mice. E: Primary human muscle derived cells differentiating over 0, 72hrs and 7 days with increased MyoD, Myogenin and MYHC I & II as well as reductions in Myf5 gene expression (Eii), corresponded with UBR5 increasing at the protein levels at 72 hrs and 7 days of human cell differentiation (Eiii). 2. Does Aged Skeletal Muscle have an Epigenetic Memory of Disuse Atrophy? Given that our work has now demonstrated that healthy adult human skeletal muscle has an epigenetic memory of muscle hypertrophy after earlier exercise. We wish to extend these findings and develop our exciting studies with Prof. Jarvis and Dr. Owens (LJMU), and undertake studies to investigate if aged skeletal muscle has an epigenetic memory of disuse atrophy. 3. Do Muscle Cells have a Memory of the Hypertrophic Niche? Role of Epigenetics: We also derived muscle cells from our recent human study and are looking to see if these cells retain a memory of the exercise trained niche from which they were derived. Then, we aim to investigate if these ‘previously trained cells’ respond more advantageously to hypertrophic factors once isolated in-vitro and the underlying epigenetics of this process. This work is in collaboration with Dr. Daniel Owens (LJMU) and Dr. Robert Seaborne (QMUL).